Sometimes we just have to accept that our creations do not remain our own. We put them out into the world and we know not what will become of them until it has already happened. Of course I’m talking about a drink. What else would I be talking about? Stir with ice, strain into a chilled coupe glass. Garnish with an orange twist. At the risk of being boastful, this may be the best RumDood original drink I’ve ever done. For the rum, I recommend either El Dorado 8 Year Old or El Dorado 12 Year Old, depending on how sweet you want it (the 12 will make the drink a little sweeter than the 8 will). For the Scotch, I usually go with Laphroaig 10 Year, but that’s mostly because that’s what I made it with originally. I’ve made it with Ardbeg, Ardmore – just something peaty. If it looks like this drink was created on a dare, that’s because it was. I was working at 320 Main one night (as I am wont to do) and a gentleman came in and asked if I was “the rum guy” he heard worked at the bar. After I confirmed his suspicion, he threw down a rather odd-shaped gauntlet. I blinked a few times as my mental roladex spun until smoke started coming out of my ears. I coudln’t think of any rum and Scotch drinks. I still can’t think of any. Maybe there’s an entire mixological world out there that I don’t know about – rich tomes of bound leather and parchment filled with runic symbols performing some sort of rum and Scotch alchemy, all lining the walls of some monastery in Southern France, carefully looked after by bearded men and women, all clad in spun cloth. For some reason my mind had settled on Chris Hannah’s incredibly delicious Bywater Cocktail as something that might be able to work. 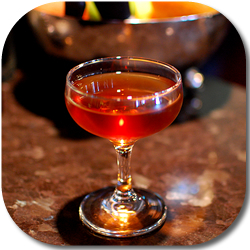 It’s got strong, bold flavors in it – why couldn’t it be tweaked to accept a little Scotch? So I grabbed some bottles and made a makeshift drink on the spot – exactly like you are never supposed to do – and it made the man happy. Of course, after he left I spent the next 3 days changing proportions and swapping ingredients (the original version had .75 oz of Laphroaig 10 Year in it – it tasted like Laphroaig 10). What you see here is the final version of the recipe. I know there are already some people wondering about the name of the drink. In generally, you don’t name a drink after a celebrity unless it’s THEIR drink. After putting this together, I went through my list of drink names to create drinks for and none of them fit. Jason Schiffer said the drink made him think of Jon Hamm’s briefcase from Madmen, and we just sort of started referring to the drink by that name because naming things is hard and I figured I’d just come up with a more permanent name later. A funny thing happened along the way to actually writing this up: the drink started getting served to people by other bartenders, and since I had put the whole “naming my drink” thing on hold, customers came to know it as Jon Hamm’s Briefcase. One night I walked into Napa Rose at the Disney Grand California Hotel and declared that I had thought of a new name for the Jon Hamm’s Briefcase. I was then mobbed by four (yes four) customers who got very excited and told me that the Jon Hamm’s Briefcase was one of their favorite drinks and I better not change the name. So there you have it. I can’t name my drink now because I didn’t name it. I mean, I did. You can call it the Woodhouse if you’re one of the three people out there who aren’t Jon Hamm fans. Or, if you have a better idea for a name, post it in the comments! *UPDATE: Since I posted this partially to meet my pinky-swear obligation to post every month now, and I was the last person in my cadre of pinky swearers to do so, I think the alternative name should be DEAD LAST. But what do you think? Hey Matt! Anyway it’s a nice post and an intriguing cocktail. Please suggest a substitution for Ciociaro Amaro. Any another amari – Luxardo, Ramazzotti, Averna, Montenegro? Looks fantastic! BTW if the ruling of the judging committee aka Cari holds, Lauren’s post doesn’t count so you’re (almost) dead last. 🙂 How about taking the Mad Men idea even further and calling it Don Draper’s Briefcase? I honestly haven’t found a lot of amari that work in this. Nardini Bassano works. Amaro Nonino might work. this one is awesome. i approve. lauren is last!! what about “Dead Last-ish” if we give Lauren like halvsie credit for posting at least SOMETHING. I pinky swore on Saturday… so I’ll be starting this month.